Plus, Anthony Martial reminds Jose Mourinho of what he already has. West Bromwich Albion's Salomon Rondon looks upset after his attempted shot resulted in a bad injury for Everton's James McCarthy. EVERYTHING SEEMED TO be going so well for James McCarthy. On 30 December, against Bournemouth, after a lengthy period out injured, he made just his second Premier League start of 2017. McCarthy appeared in the top flight on three more occasions thereafter, including the 2-0 loss to Man United, where boss Sam Allardyce hailed the Ireland international as the Toffees’ “shining light”. 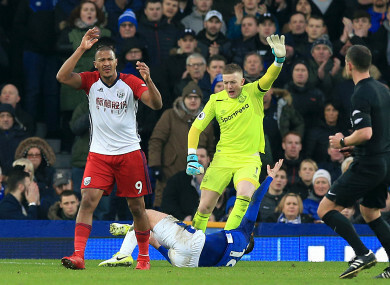 However, against West Brom, the Everton midfielder suffered another major setback, with a double leg fracture the result, after an unfortunate collision with Salomón Rondón. The recovery process will now be lengthy, and though McCarthy has had setbacks before, this latest mishap is likely to be the greatest test of his resilience yet. The 2015-16 campaign is the last time he put a sustained run of games together and the Glasgow native is unlikely to play again in 2018 after Saturday’s incident. It is a blow not just for Everton, who are still only seven points clear of the relegation zone, but also Ireland. At his best, McCarthy is one of the best defensive midfielders in the Premier League and the Boys in Green are not blessed with an abundance of stars playing at this level. However, the 27-year-old at least doesn’t need to look too far for advice on the issue. Previous leg break victim Seamus Coleman was seen leaving his seat at Goodison Park just after McCarthy was taken off on a stretcher and the Donegal native will no doubt have plenty of useful advice to offer, as he knows almost exactly what his team-mate is going through. If anyone thought Man City might be still reeling from last week’s loss to Liverpool, they will have been sorely disappointed watching Saturday’s late kick-off at the Etihad Stadium. Pep Guardiola’s side, who went 12 points clear at the top of the table after their latest result, were well worth their victory. The statistics highlight the extent of City’s dominance — according to the BBC, Newcastle had just 19% of the possession, as well as six shots compared with 21 for the hosts. “We need 10 more wins to be champions, and we’ll try for more points,” Guardiola said afterwards. “We face these kind of teams — Southampton, West Ham, Bournemouth, who play with the 5-4-1 — that’s why it’s so important to attack this kind of team. “It’s not how many goals you score, it’s how many chances you create, it’s how many chances your keeper has to save. It was important how we reacted at 2-1, we didn’t panic. “We reacted really well after dropping points before. It was an outstanding performance, often against 11 behind the ball, we were patient, and we found the space really well. They crossed the halfway just once and scored, but we’re so happy. Alexis Sanchez’s absence was not keenly felt, as Arsenal comfortably overcame Crystal Palace 4-1 on Saturday. Any thoughts that the Chile international won’t be missed in the long run, however, are misguided, even if the North London side do manage to land the impressive-looking Pierre-Emerick Aubameyang as a replacement. There has been a tendency among some critics in recent days to downplay Sanchez’s importance to a degree. Arsene Wenger, for instance, claimed the loss won’t be as significant as when Robin van Persie left the Gunners for Man United in 2012. But there is no doubt that Arsenal are a lesser team without their star attacker. Sanchez, who is understood to have said his goodbyes to Gunners team-mates, has been a consistent goalscorer and creator for the side since joining from Barcelona in 2014 for £31.7 million. Even last season, the Gunners’ worst top-flight campaign in recent memory, he managed an impressive 24 goals in 38 Premier League appearances. At his best, there are few attackers as talented as Sanchez in the Premier League or anywhere else in the world. The 29-year-old’s arrival at Old Trafford will consequently go some way towards lessening the obvious gap in quality between the Red Devils and City currently. In a season where the title race looks over before it even got going, Burnley presented an intriguing narrative away from the usual bang and noise of the top six in the Premier League. Sean Dyche had assembled a disciplined, tough-to-beat side who showed the tenacity to defeat all comers who dared cross them in the first half of the campaign. The Clarets won a magnificent nine of their opening 16 games this season and, before Christmas, even held fourth spot for a weekend ahead of Liverpool and Arsenal. But since the beginning of December the shine, shimmer and novelty of Dyche’s side has worn slightly and is not appearing as bright as it once seemed. The Burnley manager was touted by some as a potential successor to Gareth Southgate as England manager, owing to the miracles he had been pulling following their opening weekend victory against champions Chelsea, as well as later draws with Liverpool and Tottenham. But the Clarets are without a victory since 12 December and, following Saturday’s 1-0 defeat to Manchester United, have now failed to win a game in their last eight in all competitions. The side have been plagued by injuries, including Ireland trio Robbie Brady, Jonathan Walters and Stephen Ward. This misfortune has been a key reason for their drop-off, which has seen them descend further and further down the table, as rivals such as Everton and Leicester rise. Dyche’s side are out of the FA Cup, EFL Cup and have taken just three points from the last 21 available. Their brief flirtation with a Champions League spot seems a distant memory now as the harsh realities of a 38-game Premier League season take hold. They are not the all-conquering, gravelly-voiced victors they appeared at first. However, as demonstrated in their narrow 1-0 defeat on Saturday, they remain a compact, well-drilled side, capable of holding their own against significantly better opposition in spite of the team’s current problems. In the Premier League table, they remain eighth, six points ahead of their nearest competitor. European football may now be out of reach, but remaining only eight points behind a club with the financial muscle and history of Arsenal is an achievement in itself. Anthony Martial will be fully aware of how tenuous life at Man United is right now. Jose Mourinho’s treatment of Henrikh Mkhitaryan this season shows just how a relationship between player and manager can deteriorate in a short space of time. Despite recording five assists in his first three games at the beginning of the campaign, the Armenian has fallen down the pecking order dramatically at United, making just 11 starts in total since the start of the season. Mkhitaryan is now being used as a bargaining chip to bring Alexis Sanchez in the opposite direction. While Sanchez’s arrival at Old Trafford will bring renewed steel, speed, grit and goals to the side, it also probably means a starting position will be automatically taken away from those already competing for it. Mourinho will now have to find a place for Sanchez amid a host of other forwards who will feel they warrant regular playing time; including Marcus Rashford, Juan Mata, Jesse Lingard, Romelu Lukaku and a returning Zlatan Ibrahimovic. Martial, in particular, has shown brilliant form since the new year. Saturday saw United record their fourth win in as many games in 2018, while also extending their unbeaten streak to eight games with a 1-0 victory at Turf Moor against Burnley. It also marked a third goal in four games for Martial; with the forward’s blistering strike off the underside of Nick Pope’s crossbar earning Mourinho maximum points this calendar year, as his side attempt to mount the most improbable of title chases on league leaders Manchester City. The French international scored six goals in the first half of the season despite limited opportunities. He will be cautious of Sanchez’s arrival at Old Trafford as it may mean a position in his preferred left-wing role is no longer viable — regardless of form. Email “Luckless James McCarthy, Man City 10 wins from glory and more Premier League talking points”. Feedback on “Luckless James McCarthy, Man City 10 wins from glory and more Premier League talking points”.